For those serving in our nation’s Armed Forces, there’s a great credit card offer that comes with plenty of perks and benefits, designed especially for those protecting our great nation. 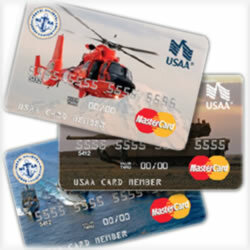 This week, we explore the USAA Rewards Active Military MasterCard, its benefits and fees. There’s a lot more to this credit card offer than just a MasterCard logo. This credit card offer from USAA Bank is designed solely for those who are currently serving or have served in the military in the past. This versatile credit card comes with no annual fee and no minimum finance charge. You’ll enjoy payment flexibility, low APR rates – down to 9.9% – and no shortage of ways to earn rewards points. They can be redeemed for cash, merchandise, travel and even gift cards. No blackout dates, either, if you use your points for airlines. Perhaps what’s most impressive with this credit card offer is the payment options. Because our military members have unique financial needs, USAA rises to the top to accommodate those needs. Plus, special rates apply while military service members are deployed or PCS for up to twelve months. All of your foreign transaction fees are reimbursed when you’re deployed, as well. If your military campaign is eligible, you’ll see a 100% rebate on all of your finance charges, which is something you won’t find anywhere else. That said, if you are deployed, and your account APR is dropped, it won’t apply to purchases made prior to deployment, nor will it apply to purchases after having completed the mission. This MasterCard is designed for those with good credit. Keep in mind that the APR will vary from one applicant to another and those variations are based mostly on one’s credit scores. The lowest APR is 9.90%, but there are those who are approved with less than ideal credit scores, only at higher rates. Because the interest rates are variable, they could – and likely will – shift from one month to the next. That said, with consistent credit scores, most consumers never see much in the way of fluctuating APR rates. What we found to be current is an average FICO score of 705; in fact, a score at least that high ensures you’re approved. Anything too much lower than that threshold, though, could go either way in terms of approval. There are a number of other factors that this issuer may also consider when making decisions for approval, so don’t focus too much on the numbers. Your grace period is twenty five days, which means you may not see interest calculated on some of your most recent charges. Apply online for an instant answer. You’ll also enjoy 2,500 bonus points once you make your first purchase and then one point for every dollar spent on purchases. Not only that, but there are no limitations on how many rewards points you can earn. A new feature with the USAA Rewards Active Military MasterCard is the option to redeem your points via your smartphone. Of course, you can also use the website. Both of these services are offered at no cost to cardholders. Members can log on to check their balances, their available credit line and reminders can be set up for both a smartphone and email options. Make your payments online, apply for new products and, of course, communicate with bank employees. Tax season is simplified when you download all of your credit card statements. It’s just one more way of taking those financial concerns off your shoulders. Did you apply only to learn you’re not eligible? There are other USAA credit cards and financial products you may qualify for. It’s a fine financial institute, with stellar reviews from both new and long time customers. Members can be either active military or military veterans and the entire suite of financial products are available to both. A few of those product offerings include investment options, shopping and services discounts, insurance choices and of course, a complete banking service. Members may also add their family members for many of the same products and offers. Widows, widowers, spouses, children and more may also join, provided they can show proof that they’re related. This is one of the most popular – if not the most popular – credit card offers for military members. With an around the clock team of customer service agents, getting help or questions answered is easy and fast from anywhere in the world. Take advantage of chat option or call the 800 number located on the back of the credit card. As many credit card companies are now charging their customers just to speak to a live operator, you’ll never have to worry about that with your USAA MasterCard – there are no additional fees for this option. Remember you’ll need to present proper credentials once you’re preliminarily approved, but once you are, you’ll be provided your new credit card number, your credit line and the current APR you’re paying. Without proof of having served in the military, you may find a few stumbling blocks. USAA remains dedicated to the financial well-being of members of the military and their families for generations to come. USAA was founded in 1922 in a slightly unusual way. Twenty five Army officers who offered to insure each other’s vehicles when no one else would. Today, their tiny organization has grown into a respected institution offering a full range of financial products to millions of members. It continues to focus on providing the best products and options for those who protect our country. It’s all about best-in-class service that helps members meet their financial goals while planning for the future.